One of the few ways to detect trouble is to push past glowing state accounts and count the firings. There are many. In Turkmenistan, statistics are not so much a science as an art. And an abstract art at that. So when deputy prime minister Gochmurad Muradov announced on May 4 that the economy had grown by 6.2 percent in the first quarter, this had to be reconciled with the fact that at the very same government meeting President Gurbanguly Berdymukhamedov had sacked the head of the State Committee on Statistics. Randomly firing top officials is a well-worn tradition in Turkmenistan. Since state-sanctioned chronicles reflect only glowing news, tracking the downfall of the inner circle is one of only a few ways to glean what is happening behind the scenes. So, for instance, the government website claimed on May 4 that the state-run oil and gas monopoly had fulfilled its production quotas. Exceeded them slightly even. Why then did Berdymukhamedov feel the need to formally reprimand Energy Minister Charymyrat Purchekov? Alas, all the chairman of the State Service for Sea and River Transport, who must have been closely involved in the port project, got from Berdymukhamedov was a reprimand for his “unsatisfactory execution of official duties.” No details were provided, as ever. Berdymukhamedov had invited the president of neighboring Uzbekistan, Shavkat Mirziyoyev, to attend the port opening ceremony. But Mirziyoyev instead sent First Deputy Prime Minister Acilbay Ramatov, who is also chairman of Uzbek Railways. Ramatov met with Berdymukhamedov to discuss improving railway links. This may be a case of putting the cart before the horse, since such reliable transportation links would ideally have been in place before the port opened. And it isn’t just international links that are wanting. The highway from Turkmenbashi to the capital, Ashgabat, still remains unfinished. Those delays are casting serious doubts on claims that asphalt plants in the northern Dashoguz province are now capable of collectively churning out 280 tons of asphalt every hour. More worrying is that the production of asphalt for road-paving is a highly water-intensive process. As the exile-run Alternative News of Turkmenistan has reported, calamitously low water levels in the Dashoguz province appear to be threatening a food shortage. Undaunted, the government has announced yet another new highway, which would run from Turkmenbashi parallel with the Caspian coast up into Kazakhstan. 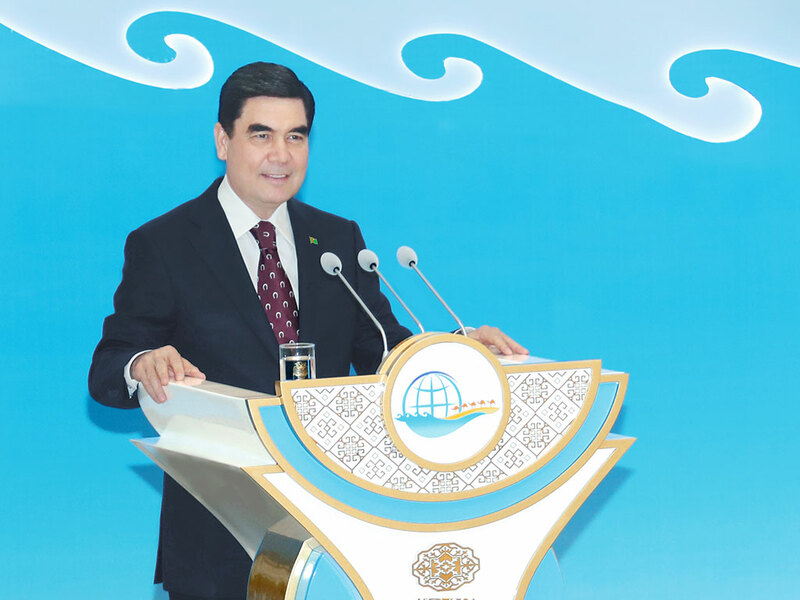 For all its talk of Turkmenistan emerging as a hub and a resurgent transit point on the New Silk Road, the government's announcement of its priorities regarding international transport and communication dwell little on cooperation with other nations. Kazakhstan receives only a cursory mention. Uzbekistan, nothing at all. The trick of ignoring the outside world is duly reciprocated when international events are held in the country. Little attention was paid to the summit of the Economic Cooperation Organization that was held in Avaza resort, which is just down the road from Turkmenbashi. This vapid talking shop did, however, yield one fascinating video nugget recorded off state television by the Chronicles of Turkmenistan, a news website linked to the foreign-based opposition. The clip showed Berdymukhamedov's son, Serdar, who was recently appointed the deputy foreign minister, opening the conference by giving a speech in English. As some typically cruel YouTube commenters noted though, Berdymukhamedov junior slavishly recited, often incoherently, from a prepared script, never once raising his eyes from the page, leading viewers to question his mastery of the language. Items fit for the weird news bin continue unstintingly to filter out. Chronicles of Turkmenistan has doubled down on reports earlier this year by claiming there are moves afoot to ban all but white cars from the roads at the start of this summer. The report in March claimed the sale of non-white cars was to be banned. Similar stories have cropped up over the years and are usually among the few things an international audience ever gets to hear about the country. In 2015, the BBC website and RFE/RL relayed stories about a ban on the import of black cars. It is difficult to keep up with the evolving claims, but it is instinctively temping to give them credence given how readily the government issues eccentric edicts. On a related topic, RFE/RL's Turkmen service, Azathabar, cited a correspondent in Lebap province as saying that the government may be mulling a ban on the sale of used cars made before 2010. For a country in which Soviet-era vehicles are a frequent sight, this would be quite remarkable. Azathabar has followed up on its reporting from recent weeks about Turkmen students in Russia, noting that they were still awaiting bank transfers from Turkmenistan to their education institutes. Money sent in February and March has still reportedly not been received. Funds are disappearing into Turkmen banks at an increasingly disturbing rate, the broadcaster claimed. Some ATMs are reportedly pulling same trick — taking money off accounts without actually spitting out the requested funds.